Be sure to join an upcoming test-taking webinar or watch one of our recordings here. If you know what is on the test ahead of time, read and review. Take time to study material you DO NOT know. Use notecards and quiz yourself. Arrive to the test rested. Do not cram and pull an all-nighter the night before. Eat a well-balanced meal prior to the test to avoid hunger distractions and loss of energy. Be prepared by making a list and bringing all necessary items on test day. Some tests require a number two pencil and ID for entry. Always be alert and ready as to avoid any initial stress. Choose comfortable clothing and layer so you are neither too hot nor too cold. Don’t talk to others right before the test, their nerves can influence your mood. Keep a good attitude and remain calm. Take deep breaths if you find you are getting anxious. Avoid careless mistakes by thoroughly reading all directions before answering. If there is time, scan the test ahead of time. Simply looking over what you are about to do can alleviate anxiety and the fear of the unknown. Answer the easiest questions first. This will build confidence and help gauge your time. Don’t linger on one question too long. Use the process of elimination to eliminate incorrect answers and narrow down your choices. If time permits, you can come back and review. Go back and answer the trickiest questions last. Show your work when applicable and use an outline for essay tests with a sequence of points you wish to make. Recognize that in order to succeed you need to make decisions about your priorities, your time, and your resources. Positive thoughts and visualization can help curb test anxiety and control your mood and outcome. Gut instincts and our first responses are more likely to be correct. Change answers only when you have misread the question or you know for certain you have erred. Do you freak out before an exam? Are you overwhelmed trying to determine how or what to study? Do you often second guess yourself or get stuck determining the right answer? 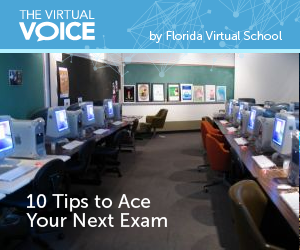 If you answered yes to one or more of these questions, please join the FLVS counselors for some test taking tips and strategies that are sure to help. We will share with you all you need to know to prepare for those pesky college placement tests (SAT, ACT, and PERT). Mark your calendars for Thursday, April 16 at 6 p.m. EST and plan to join us at www.tinyurl.com/FLVScounselors as we give you all the secrets you need to succeed on test day! This entry was posted in Homeschool Edition, Parent Edition and tagged ACT, Advisement, EOC exams, SAT, Study Skills, Study Tools, Test Anxiety, Testing, Tests, Tips for Students on April 15, 2015 by Amy LaGrasta. I really appreciate your tip to eat a well-balanced meal before you take your test. My wife told me that she is concerned about taking her test for her college class. I will be sure to make her a balanced meal before she takes her test!